The other week I received samples of several Rohrer & Klingner inks from Pear Tree Pens. I’ve been eying this brand for a while. I already have and quite enjoy a bottle of their Sepia ink. In general, I am quite liking this brand. They have some great colors and the inks behave quite well. So far as saturation is concerned, I’d say they are about like J. Herbin or Diamine’s Old English line. The Magenta is one of my favorites along with Scaboisa and Alt-Bordeaux (reviews forthcoming). Unfortunately there is only minimal shading at best. Another draw back is that it isn’t even very water resistant, so if you are prone to spills this may not be the ink for you. 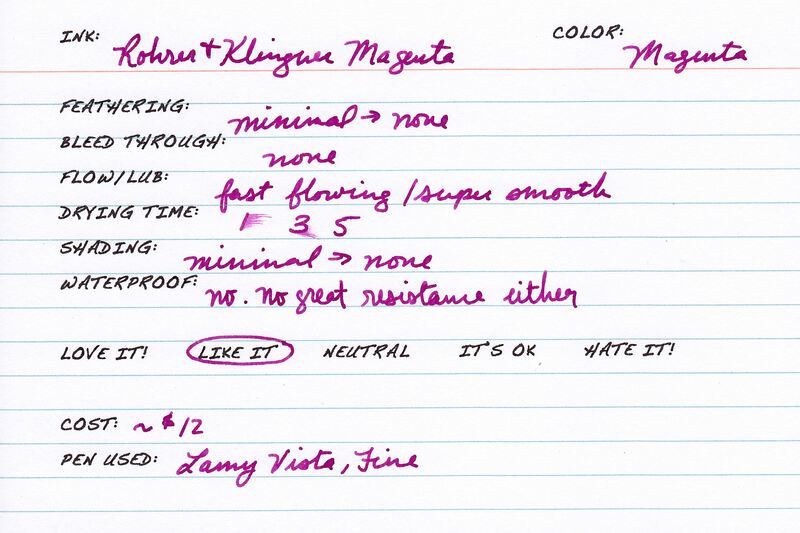 Similar to Iroshizuku Yama-Budo, ND Saguaro Wine, PR Plum, and Diamine Amaranth. I’d definitely consider getting a bottle of this once I run out of my other similar inks. I also wouldn’t hesitate to recommend it to fans of the magenta color range. This sample was sent to me for review by Ryan at PTP. I am not otherwise affiliated with them.